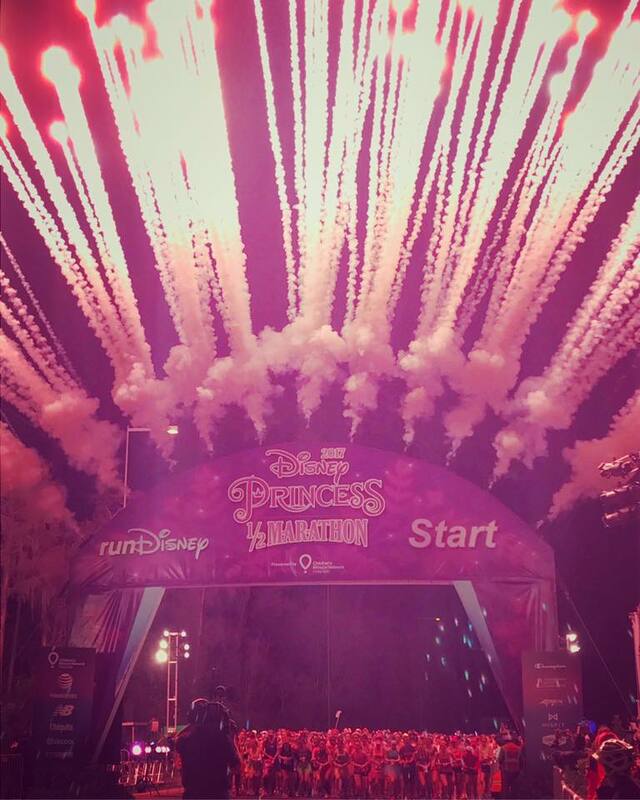 This past weekend was the 2017 Princess Half Marathon Weekend at Walt Disney World. I had many running friends who went out to run in at least one of the races this past weekend. 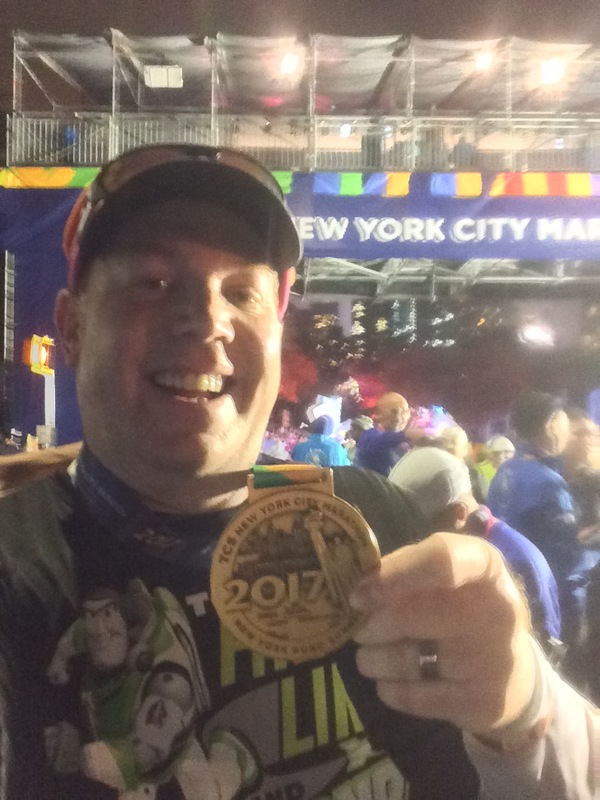 While it was fun to see all those smiling runners having fun at Walt Disney World, it was a race weekend I didn’t feel any FOMO. The Princess weekend is more for the ladies. Even though it’s perfectly fine with me that guys participate, it’s not an even that I’m wanting to run anytime soon. In addition to the Princess Half Marathon, I had running friends running at the Phoenix Marathon and the Tokyo Marathon. 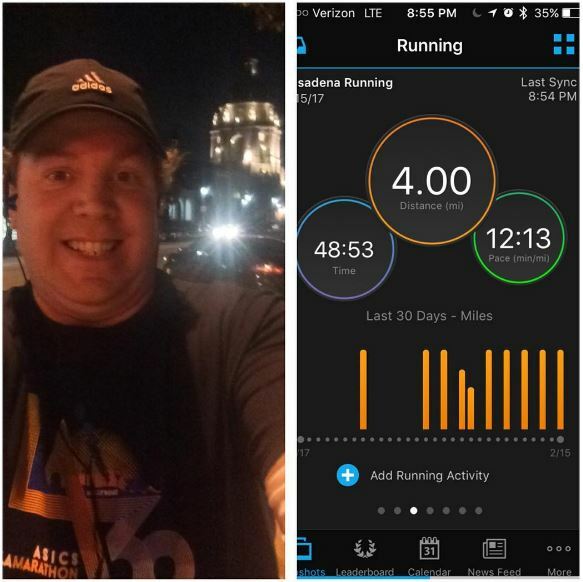 Last week, I didn’t get in a weekly recap of week 3 in my own training. 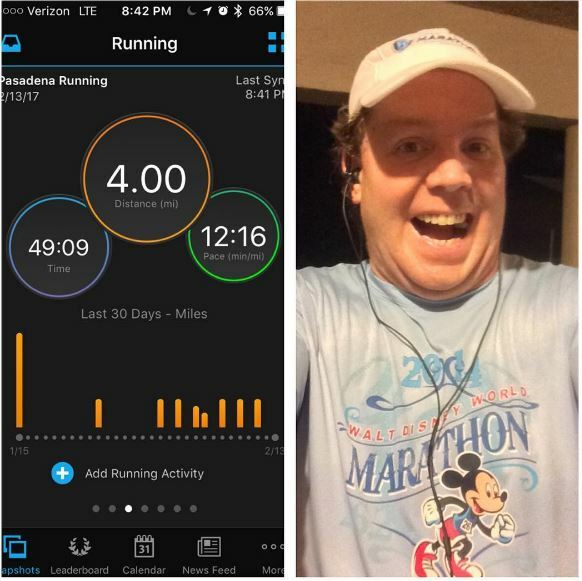 So, I thought I’d start this week off by recapping week 3 of the Rock n Roll San Diego Half Marathon training today. Then, tomorrow, I’ll recap week 4. Sound good? Here we go…. In Southern California, we’re having a much rainier (is that even a word?) start to the year than usual. Funny thing is that they said last year was supposed to be an “el nino” kind of year. I think they were off by a year. I’m going to be starting up a 10 week financial management course this coming week. The class meets on Thursday nights…one of my usual training nights. So, I thought it would be a good idea to change my training up on week 3 to run on Monday, Wednesday, Saturday, and a gym workout on Sunday. Since I missed my gym workout in week 2, it seemed like a good spot to jump in to a Monday run. Starting on week 3, I also changed my run/walk intervals. In miles 1 and 4, I ran 25 seconds, walked 95 seconds. For miles 2 and 3, I ran 25 seconds and walked 35 seconds. I’m working my way towards either the run 25 seconds, walk 35 seconds or a run 30 seconds, walk 30 seconds for the Rock n Roll San Diego Half Marathon. After 2 weeks of laying a foundation for my running, week 3 was a good week to up my game a little. Up my game I did! Mile 1 wasn’t anything too special. I was right around a normal mile 1. However, in mile 2, I saw the difference the new intervals would make as I under 12 minutes in that mile! The same was true of mile 3. When I was sitting at the end of mile 3 in under 36 minutes, I was thrilled! I even thought of keeping the run 25, walk 35 seconds intervals. But, I reminded myself that I won’t be setting any half marathon PR’s that count in week 3. So, I went back and dealt with the time I gave back. However, my overall time was more than 2 minutes quicker than the week before! These new intervals rocked! On Wednesday, the day after Valentine’s Day, I set out again with the same intervals as on Monday. Much like I experienced in week 1, my time got quicker using the same intervals! So, here’s the crazy thing. Mile 1 was not my friend. I wasn’t happy with finishing the mile in nearly 13 minutes. Even though I was convinced that I’d finish slower than Monday, I switched my run/walk intervals just like I did on Monday. When I got to the end of mile 2 and saw that I finished in 11:28, I got this huge adrenaline burst that carried me through mile 3. I didn’t realize it at the time, but I finished the first 3 miles in exactly the same time as I did on Monday! I was thrilled to be under 36 minutes at the 3 mile mark again. Just like on Monday, I resisted the urge to keep the shorter walk breaks and stay with a slow and steady improvement plan. Mile 4 actually felt really good! I loved that I finished faster than Monday! I was all primed for another fantastic week. Then the storm they called “Lucifer” came upon Southern California. The worst of it hit on Friday. 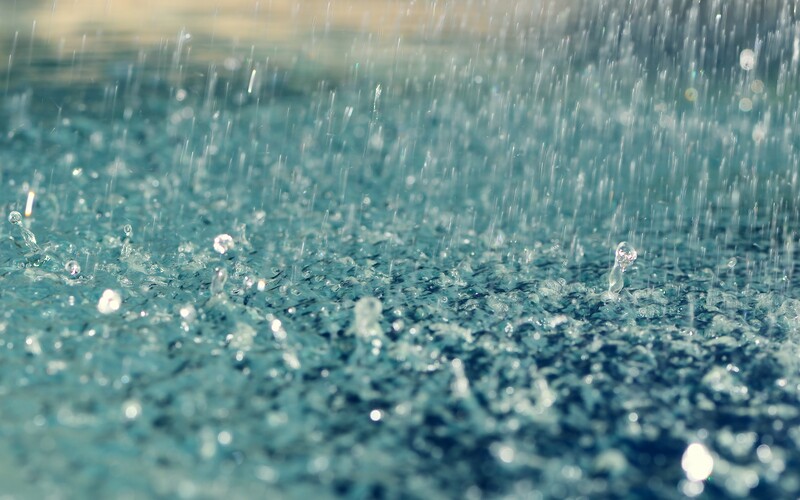 According to the forecast, there would be a short window without rain on Saturday morning for my scheduled 5 mile run. However, the rains on Friday took their toll on my apartment. We sprung a leak in Colton’s room. It was a total mess. On Saturday, instead of running, I was waiting on our super and his carpet guy to check on the room. It was a long and drawn out day that ended with Brooke and myself deciding to stay at her parent’s house (they live close to us). In all the moving of our stuff and the stress caused by this sudden uprooting, I ended up loosing not only the 5 mile run on Saturday, but my 2nd straight gym workout. So, week 3 ended up being a bust in training. Come back tomorrow to see how week 4 turned out…it turned out to be a better week!